Safe and cozy, it's Rose's way! Hope you stay safe and cozy today! Don't let any grabby humans get too close. Great hidey-hole! That's a good place to be cozy. We are having really strong, cold winds today. At least we "dodged the bullet/blizzard" that Cape Cod got! 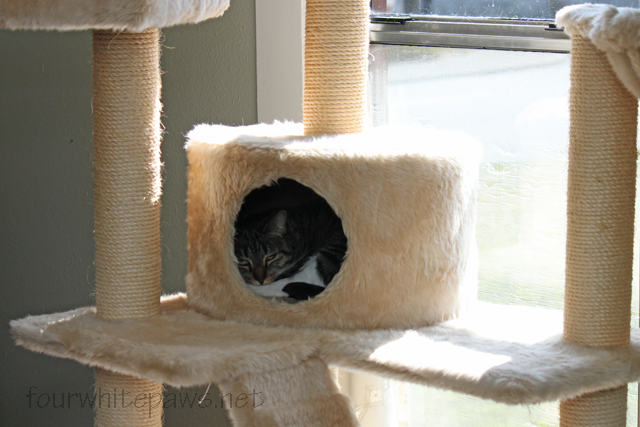 She may be the only cat that will FIT into that hole! Rose you picked a great spot! That looks like a great place to spend Wednesday or any other day ending in "y". MOL! Thanks for stopping by...Nicki doesn't care about the reproductive status of the cats, either. LOL. It's impossible to tell which cats have homes and which don't, so many come and go in our complex and the complex down the hill from us (which has even more rental units, unfortunately). That sure is a comfy and safe hidey hole! Ah Rose...but you are happy and that is all that counts. Tell Daddy to come and see the award I have for you kitties. Its over at my place.